It’s 200,000 years ago and another ice age has just started. Two species of humans continue as before. Neanderthals had been around for 150,000 years; while the older group, Homo Erectus has been around for a couple of million years. But now a new group of humans appears: Modern Man – us. Humanity has fire, which is a necessity to survive an ice age. They have simple stone tools and weapons. They face fierce predators. This is the golden age for very large mammals: mammoths, sabertooth tigers, mastodons, and many others. The large size may have protected them from the cold. Fast forward 70,000 years. Between 130,000 and 110,000 there is an inter-glacial period. The ice sheets recede. The climate approaches what it is like in historic times. 20,000 years may not seem like such a long time compared to the time scales we discuss here but consider that our own civilization goes back only 5,000 years. For 20,000 years, those early humans had plenty of time to develop the same kind of civilization that we experience now. So why didn’t they? 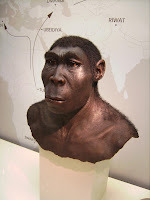 Pictured is a Homo Erectus, the most primitive of the 3 groups of humans. Source: Wikipedia.